For the image 'embedding' part of this recipe - we should be just about ready to go - with one caveat. You'll need to be sure that the Media browser icon is available to the WYSIWYG editor in use. I'm using the WYSIWYG Drupal module, and I've added the Media browser icon to my Filtered HTML content profile - which is currently set to use CKEditor 3.6.5.7647 (I'm not sure that the WYSIWYG module supports v4 of the CKEditor yet - hence 3.6.5.7647). We're ready to create our story. Create a new content item (Basic Page or whatever), place some text in the body of your post - enough text so that we can see how we can force the image to align either right, or left along with a caption below the image. Then click on the Media browser icon and upload (or choose) an image. 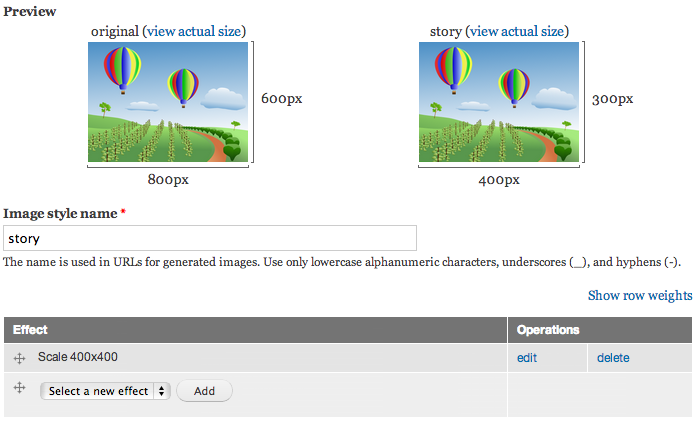 If you're uploading an image for the first time - you'll have a chance to fill in the Caption field. 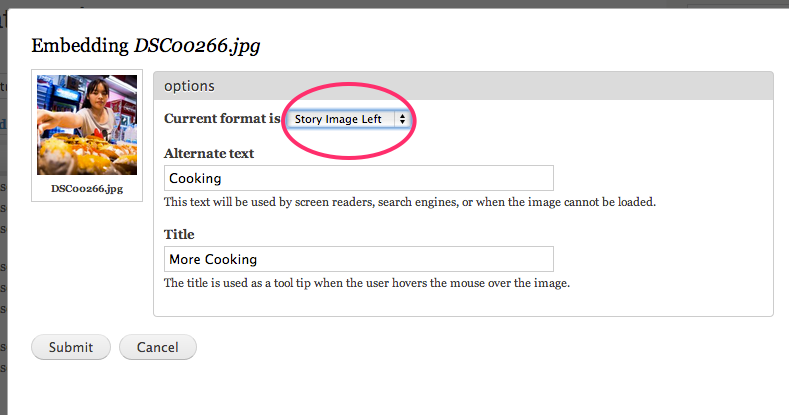 Otherwise you can add the caption before you embed the image using the Content -> File UI. 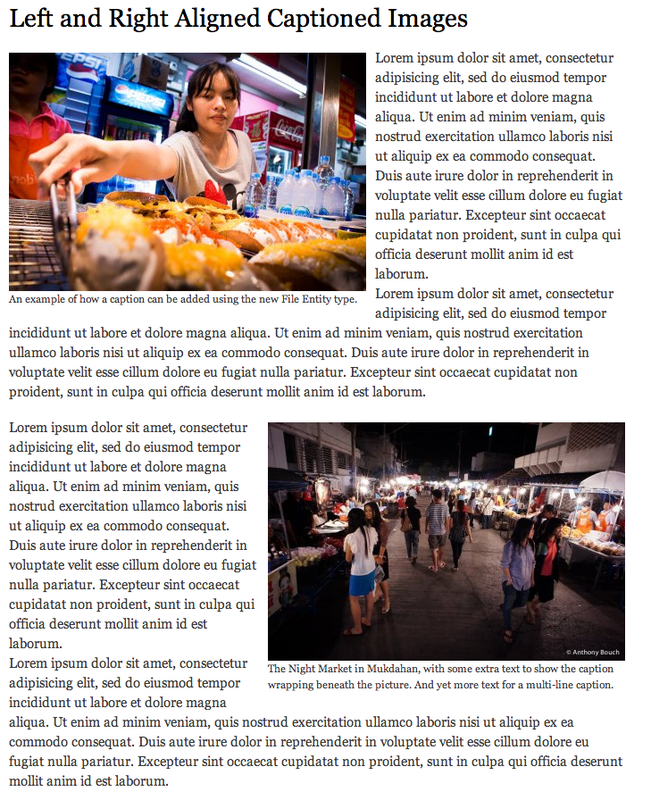 Assuming you've got an image, with a populated caption field, go ahead and click on the Media browser icon, choose your image, and most importantly - just before you embed it - set the current format of the embedded image to either the Story Image Left, or Story Image Right view mode. The screen below will appear as the second step in the embed process. For module developers, there is also a hook in the Media module that will let you decide which elements you'd like to use to surround the image and caption hook_media_token_to_markup_alter. 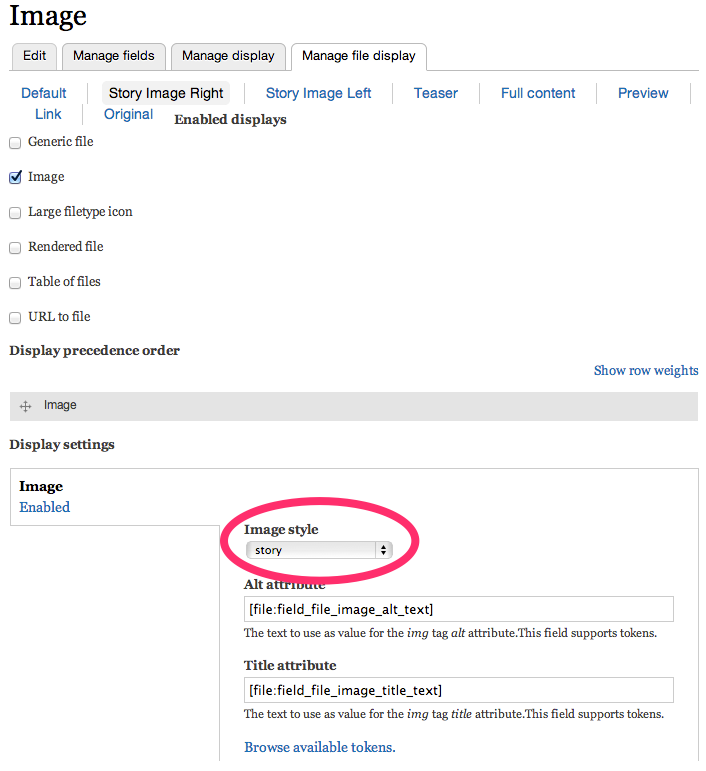 And of course there are other strategies and modules for captioning images in Drupal - although few that let site builders decide for themselves how captioned images should be implemented. There is also a philosophical choice about where you think the caption data (and other data for your files) belongs, and whether you want to hand this over to Drupal fields, or keep the caption in the content of your post using some other WYSIWYG plugin, or insertion module, but I think the method above is okay. Would be interested to know what other Drupalers out there think, and hope that some of what's here is helpful in general. Excellent write up and great uses of screens and examples to illustrate. The tricky aspect of the this recipe is understanding how file view modes connect back to image styles. Great job making that clear. Up to now, I've been using the Insert module with an "inline_images" field to allow an editor to insert inline images with styles, but this leaves out captions. WYSIWYG + Media is a more elegant, complete solution, albeit with some extra configuration overhead. I'm looking forward to trying this out. Hi Anthony, great post!!! I am trying to do it the same way - but caption is never displayed (even not included in the media embed tag). I am using current dev-releases of media (7.x-2.x-dev - 2015-Oct-01) and the additional field is not included when using wysiwyg media embed button. Thank you for this post. I tried to do the same but I've the same problem Kai has with the 7.x-2.0-beta1 media release. Did you find any solution ? I had this issue, too. Check the Text format you're using: Convert Media tags to Markup should be checked and listed 1st under Filter processing order. Oh, never mind. My solution was for the image not showing up, not the caption. Sorry. We have extra long caption on our images we supply on our press releases. Thee captions are being truncated. Is there a way to add to the caption character count? I've been trying to use this tutorial in D8 and I must say I'm stumped. The instruction "Enable both view modes for just the 'Image' file type." Doesn't seem to apply anymore and I don't get a "Manage file display" tab later on. Did anyone manage to make this work under D8? Is there an updated version of this tutorial for Drupal 8? The File Entity module doesn't seem to work in the same way anymore and will be deprecated soon. I believe media, and file entity are coming to Drupal 8.4.